Wiens, Thomas K. and Walker, Lawrence J. 2019. Examining the relationship between bright and dark personality traits in two management samples. Personality and Individual Differences, Vol. 141, Issue. , p. 92. Woo, Sang Eun Chae, Minwoo Jebb, Andrew T. and Kim, Yongdai 2016. A Closer Look at the Personality-Turnover Relationship. Journal of Management, Vol. 42, Issue. 2, p. 357. Schyns, Birgit 2015. Dark Personality in the Workplace: Introduction to the Special Issue. Applied Psychology, Vol. 64, Issue. 1, p. 1. Ashton, M. C., Lee, K., deVries, R. E., Hendrickse, J., & Born, M. P. (2012). The maladaptive personality traits of the personality inventory for DSM-5 (PID-5) in relation to the HEXACO personality factors and schizotypy/dissociation. Journal of Personality Disorders, 26, 641–659. Benson, M. J., & Campbell, J. P. (2007). To be, or not to be, linear: An expanded representation of personality and its relationship to leadership performance. International Journal of Selection and Assessment, 15(2), 232–249. Blashfield, R. K., & Reynolds, S. M. (2012). An invisible college view of the DSM-5 personality disorder classification. Journal of Personality Disorders, 26, 821–829. Christiansen, N. D., & Robie, C. (2011). Further consideration of the use of narrow trait scales. Canadian Journal of Behavioural Science, 43, 183–194. Christiansen, N. D., & Tett, R. P. (2008). Toward a better understanding of the role of situations in linking personality, work behavior, and job performance. Industrial and Organizational Psychology: Perspectives on Science and Practice, 3, 312–316. Christiansen, N. D., & Tett, R. P. (2013). The long and winding road: An introduction to the handbook of personality at work. In Christiansen, N. D., & Tett, R. P. (Eds. ), Handbook of personality at work (pp. 1–7). New York, NY: Routledge. Collins, J. M., & Schmidt, F. L. (1997). Can suppressor variables enhance criterion-related validity in the personality domain? Educational and Psychological Measurement, 57, 924–936. Costa, P. T. Jr., & McCrae, R. R. (1992). Revised NEO Personality Inventory (NEO PI-R) and NEO Five-Factor Inventory (NEO-FFI) professional manual. Odessa, FL: Psychological Assessment Resources. De Fruyt, F., De Clercq, B., De Bolle, M., Willie, B., Markon, K., & Krueger, R. F. (2013). General and maladaptive traits in a five-factor framework for DSM-5 in a university student sample. Assessment, 20, 295–307. De Fruyt, F., De Clercq, B. J., Miller, J., Rolland, J., Jung, S., Taris, R., … Van Hiel, A. (2009). Assessing personality at risk in personnel selection and development. European Journal of Personality, 23, 51–69. Fritzsche, B. A., McIntire, S. A., & Yost, A. P. (2002). Holland type as a moderator of personality-performance predictions. Journal of Vocational Behavior, 60, 422–436. Guenole, N. (2014). Maladaptive personality at work: Exploring the darkness. Industrial and Organizational Psychology: Perspectives on Science and Practice, 7(1), 85–97. Harkness, A. R., & McNulty, J. L. (1994). The Personality Psychopathology Five (PSY-5): Issue from the pages of a diagnostic manual instead of a dictionary. In Strack, S., & Lorr, M. (Eds. ), Differentiating normal and abnormal personality (pp. 291–315). New York, NY: Springer. Harms, P. D., Spain, S. M., & Hannah, S. T. (2011). Leader development and the dark side of personality. Leadership Quarterly, 22, 495–509. Hartley, E. L. (1967). Attitude research and the jangle fallacy. In Sherif, C. W., & Sherif, M. (Eds. ), Attitude, ego-involvement and change (pp. 88–104). New York, NY: Wiley & Sons. Hoekstra, H. A., & De Fruyt, F. (2013). NEO-PI-3 Persoonlijkheidsvragenlijst [NEO-PI-3 personality inventory]. Manuscript in preparation. Hogan, R., & Hogan, J. (1997). Hogan Development Survey manual. Tulsa, OK: Hogan Assessment Systems. Jones, J. W., & Arnold, D. W. (2008). Protecting the legal and appropriate use of personality testing: A practitioner perspective. Industrial and Organizational Psychology: Perspectives on Science and Practice, 1, 296–298. Karraker v. Rent-A-Center. 411 F.3d 831, 833 (7th Cir. 2005). Kelly, T. L. (1927). Interpretation of educational measurements. Yonkers-on-Hudson, NY: World Book Company. Krueger, R. F., Derringer, J., Markon, K. E., Watson, D., & Skodol, A. E. (2012). Initial construction of a maladaptive personality trait model and inventory for DSM-5. Psychological Medicine, 42, 1879–1890. Lilienfeld, S. O., Watts, A. L., & Smith, S. F. (2012). The DSM revision as a social psychological process: A commentary on Blashfield and Reynolds. Journal of Personality Disorders, 26, 830–834. McFarland, L. A. (2013). Applicant reactions to personality tests: Why do applicants hate them? In Christiansen, N. D., & Tett, R. P. (Eds. ), Handbook of personality at work (pp. 281–298). New York, NY: Routledge. Moyle, P. (1995). The role of negative affectivity in the stress process: Tests of alternative models. Journal of Organizational Behavior, 16, 647–668. Myors, B., Lievens, F., Schollaert, E., van Hoye, G., Croneshaw, S., Mladinic, A., … Sackett, P. R. (2008). International perspectives on legal issues in employee selection. Industrial and Organizational Psychology: Perspectives on Science and Practice, 1, 206–246. Organ, D. W., & Ryan, K. (1995). A meta-analytic review of attitudinal and dispositional predictors of organizational citizenship behavior. Personnel Psychology, 48, 775–802. Quirk, S. W., Christiansen, N. D., Wagner, S. H., & McNulty, J. L. (2003). 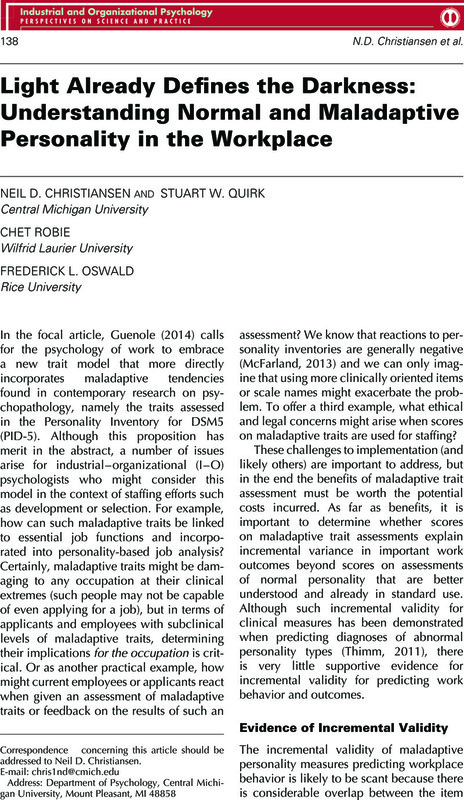 On the usefulness of measures of normal personality for clinical assessment: Evidence of incremental validity of the Revised NEO Personality Inventory. Psychological Assessment, 15, 311–325. Samuel, D. B., & Widiger, T. A. (2008). A meta-analytic review of the relationships between the five-factor model and DSM-IV-TR personality disorders: A facet level analysis. Clinical Psychology Review, 28, 1326–1342. Sarup, G. (1978). Historical antecedents of psychology: The recurrent issue of old wine in new bottles. American Psychologist, 34, 478–485. Schmit, M. J., & Ryan, A. M. (2013). Legal issues in personality testing. In Christiansen, N. D., & Tett, R. P. (Eds. ), Handbook of personality at work (pp. 525–542). New York, NY: Routledge. Shoss, M. K., & Witt, L. A. (2013). Trait interactions and other configural approaches to personality. In Christiansen, N. D., & Tett, R. P. (Eds. ), Handbook of personality at work (pp. 392–418). New York, NY: Routledge. Soroka v. Dayton Hudson Corp. 6 Ind. Empl. Rights Case (BNA) 1491 (Cal. Ct. App. 1991). Stabile, S. J. (2002). The use of personality tests as a hiring tool: Is the benefit worth the cost? University of Pennsylvania Journal of Labor & Employment Law, 4, 279–313. Strack, S. (2006). Differentiating normal and abnormal personality (2nd ed.). New York, NY: Springer. Tett, R. P., Simonet, D. V., Walser, B., & Brown, C. (2013). Trait activation theory: Applications, developments, and implications for person-workplace fit. In Christiansen, N. D., & Tett, R. P. (Eds. ), Handbook of personality at work (pp. 71–100). New York, NY: Routledge. Thimm, J. C. (2011). Incremental validity of maladaptive schemas over five-factor model facets in the prediction of personality disorder symptoms. Personality and Individual Differences, 50, 777–782. Watson, D., Stasik, S. M., Ro, E., & Clark, L. A. (2013). Integrating normal and pathological personality: Relating the DSM-5 trait-dimensional model to general traits of personality. Assessment, 20, 312–326. Widiger, T. A., Costa, P. T. Jr., & Samuel, D. B. (2006). Assessment of maladaptive personality traits. In Strack, S. (Ed. ), Differentiating normal and abnormal personality (2nd ed., pp. 311–335). New York, NY: Springer. Wille, B., De Fruyt, F., & De Clercq, B. (2013). Expanding and reconceptualizing aberrant personality at work: Validity of five-factor model aberrant personality tendencies to predict career outcomes. Personnel Psychology, 66, 173–223.